Cameron Michelle Diaz is a retired American actress, author, producer and fashion model from San Diego. Diaz breakthrough role came in 1994 when she starred in ‘The Mask’ alongside Jim Carrey. She is also best known for the films ‘There’s Something About Mary’ (1998), ‘Charlie’s Angels: Full Throttle’ (2003), ‘What Happens in Vegas’ (2008), ‘Knight and Day’ (2010) and ‘Bad Teacher’ (2011). As of 2019, Cameron Diaz’s net worth is estimated to be roughly $140 million dollars. Cameron Michelle Diaz was born in San Diego, California on the 30th of August, 1972. Diaz has an elder sister named Chimene. Her father’s family is Cuban, and Diaz’s ancestors had originally moved from Spain to Cuba. Diaz mother, Billie was an import/export agent, and her father, Emilio Diaz, worked for the California oil company ‘Unocal’. Diaz grew up in Long Beach and attended Los Cerritos Elementary School and later Long Beach Polytechnic High School with rapper Snoop Dogg. Diaz’s career began when she turned 19 years old. She first starred in the adult movie titled ‘She’s No Angel’. In 1994 she was one of the main cast in the superhero fantasy film ‘The Mask’ alongside comedian and actor Jim Carrey. The outstanding performance earned her a Golden Globe nomination. In 1997, Diaz starred in ‘My Best Friend’s Wedding’ where also stars like Julia Roberts, Dermot Mulroney, Rupert Everett, and Philip Bosco starred in. Diaz delivered an award-winning performance for that movie. One year later, Diaz was seen in the movies ‘Fear and Loathing in Las Vegas’, ‘Very Bad Things’ and the award-winning film ‘There’s Something About Mary’. In 1999, Diaz appeared in the Golden Globe-nominated film ‘Being John Malkovich’ and was also seen in the film ‘Things You Can Tell Just by Looking at Her’. In 2008, Diaz starred in one of her most popular movies ‘What Happens In Vegas’; a romantic comedy film starring Ashton Kutcher. She also starred in the film ‘My Sisters Keeper’ which was based on Jodi Picoult’s novel of the same year. Since then Diaz has been delivering some of the most popular movies for many decades. She has been starring in films such as ‘What to Expect When You’re Expecting’, ‘A Liar’s Autobiography’, ‘Gambit’ and ‘The Counselor’. The actress last-on screen appearance was in 2014’s ‘Annie’ and she later confirmed for media that she’s finished with the acting side of her career. Aside from the people mentioned above, Diaz has also worked with stars such as Tom Cruise, Justin Timberlake, Jason Segel, Jack Black, and Eddie Murphy. As of 2019, Cameron Diaz’s net worth is $140 million dollars. As of 2019, Cameron Diaz’s net worth is estimated to be $140 million dollars. 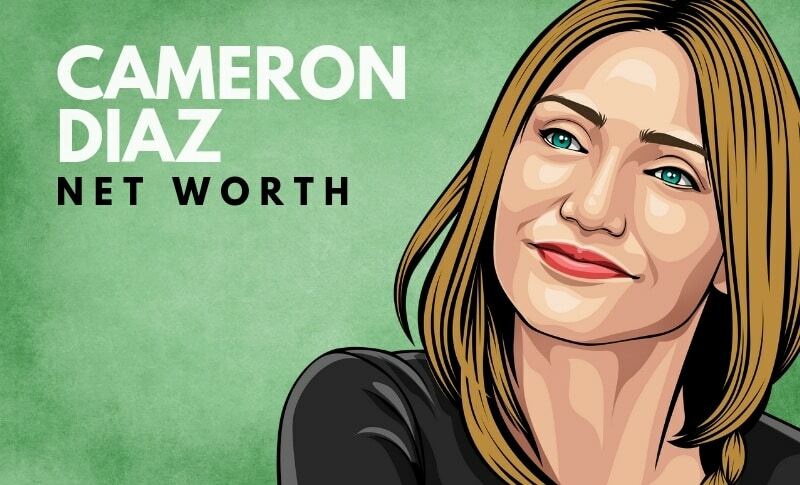 What do you think about Cameron Diaz’s net worth? Leave a comment below.